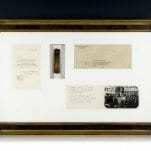 Winston Churchill Partially-Smoked Cuban Cigar with a Signed Original Photograph. 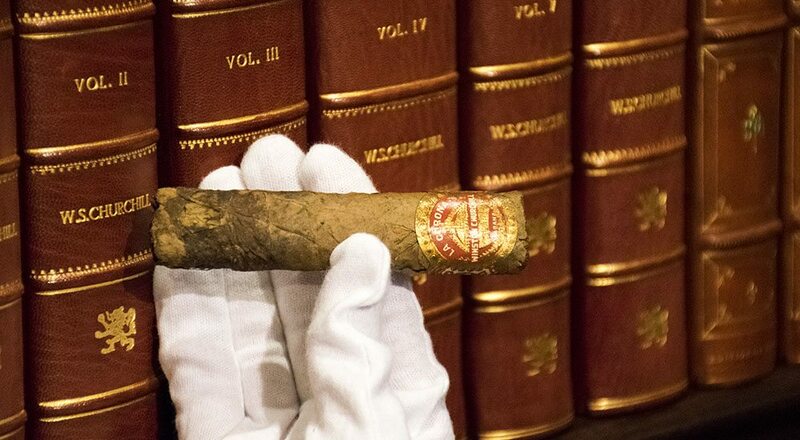 Exceptionally rare La Corona cigar partially smoked by one of the most iconic figures of the 20th century, Winston S. Churchill, bearing his own label. Accompanied by a black and white photograph of Churchill smoking that very cigar at Le Bourget Airport in Paris, France, boldly signed by him, “Winston S. Churchill.” The partially-smoked cigar was retrieved by Corporal William Alan Turner, Air Squadron Transport Command, who was a member of the cabin crew that flew Winston and Clementine Churchill to and from Northolt and Paris on May 11th, 1947. It was during this trip that Churchill was awarded France’s highest military honor, the Medaille Militaire. Corporal Turner retrieved the cigar from an ashtray “…and took the remains into protective custody” (as is noted in his included pencil annotations) after he took the accompanying candid photograph from the doorway of the plane just before Churchill boarded to return to Northolt. Turner later sent the photograph to the House of Commons with the request that Churchill sign and return it. 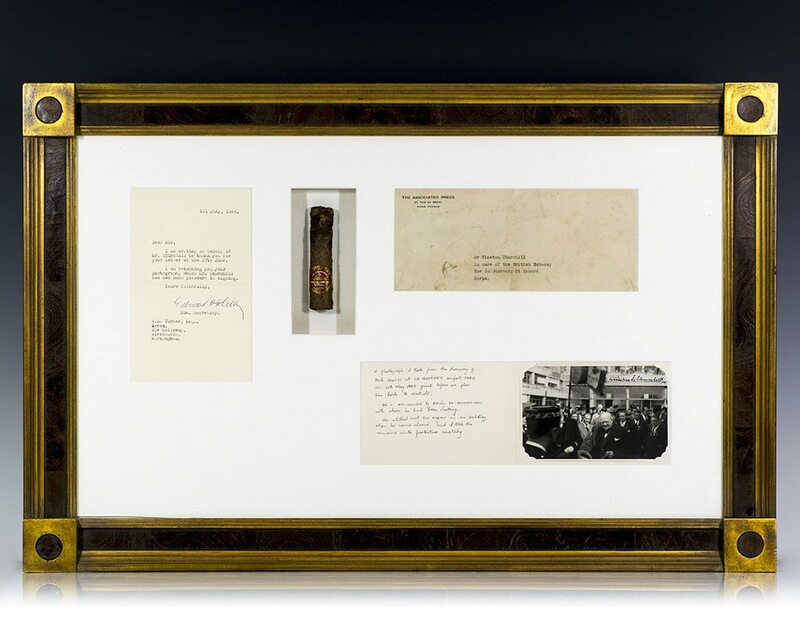 Additionally accompanied is a letter from Churchill’s secretary dated 1st July, 1949, returning the signed photograph “…which Mr. Churchill has had much pleasure in signing.” The cigar measures 4 inches long, retaining the “La Corona Winston Churchill Habana” red-and gold-label. Matted and framed, the entire piece measures 18.5 inches by 28.5 inches. An exceptional piece of history with noted photographic provenance. Throughout the majority of his political career, Winston S. Churchill was inseparable from his cigars, there are few informal photographs that show him without one. Churchill’s love of cigar smoking began with a visit to Havana in November of 1895 and led him to develop relationships with a number of regular suppliers of Cuban cigars, his favorites being Romeo y Julieta and the now-defunct La Aroma de Cuba. Churchill was known to stock between 3,000 and 4,000 cigars, mainly Cuban, in a room adjacent to his study in his country home in Kent, Chartwell Manor. As one of his valets, Roy Howells, wrote in his biography Simply Churchill, "It took me a little while to get used to the fact that in two days his cigar consumption was the equivalent of my weekly salary.” The first ‘Winston S. Churchill’ banded cigars were produced by New York businessman Samuel M. Kaplan, a great supporter of Churchill who resolved to keep the Prime Minister supplied with Cuban Cigars after his historic stand against Nazi Germany. 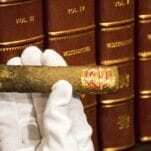 Kaplan’s first gift was a batch of 5,000 La Coronas bearing the Churchill band delivered to Churchill at the British Embassy in Washington (the batch from which this partially-smoked cigar likely originated). Churchill also received gifts in the form of cigars from the Cuban government, Cuban patron Antonio Girauder, and tens of thousands of well-wishers. British importers Peter and David Knight received consent from the Churchill Estate in the late 1950’s to begin production of the Winston S. Churchill brand cigar, which was contracted to Romeo y Julieta of Havana and remains a popular brand to this day.